The NIMHD Minority Health and Health Disparities Research Framework reflects an evolving conceptualization of factors relevant to the understanding and promotion of minority health and to the understanding and reduction of health disparities. 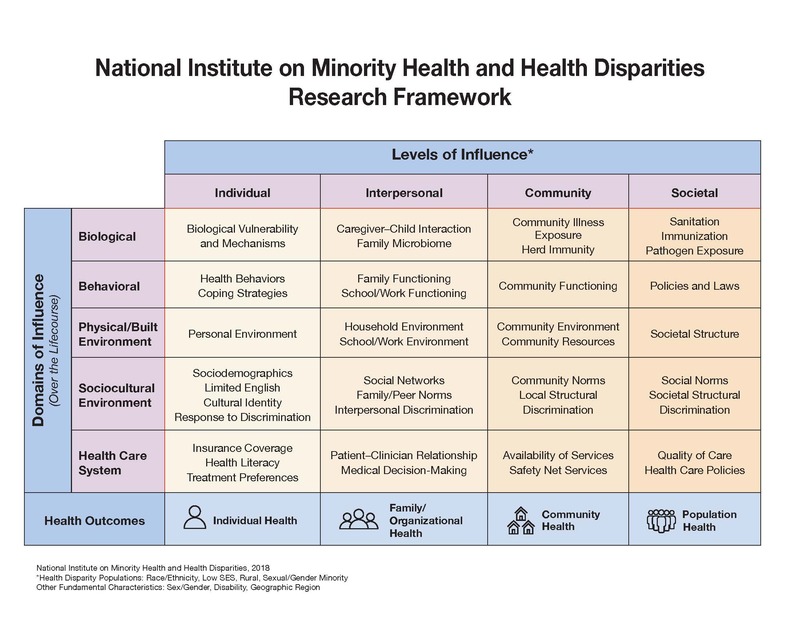 The framework serves as a vehicle for encouraging NIMHD- and NIH-supported research that addresses the complex and multi-faceted nature of minority health and health disparities, including research that spans different domains of influence (Biological, Behavioral, Physical/Built Environment, Sociocultural Environment, Healthcare System) as well as different levels of influence (Individual, Interpersonal, Community, Societal) within those domains. The framework also provides a classification structure that facilitates analysis of the NIMHD and NIH minority health and health disparities research portfolios to assess progress, gaps, and opportunities. Examples of factors are provided within each cell of the framework (e.g., Family Microbiome within the Interpersonal-Biological cell). These factors are not intended to be exhaustive. Health disparity populations, as well as other features of this framework, may be adjusted over time. If you would like to read all the details of the cells, download the attached PDF file.